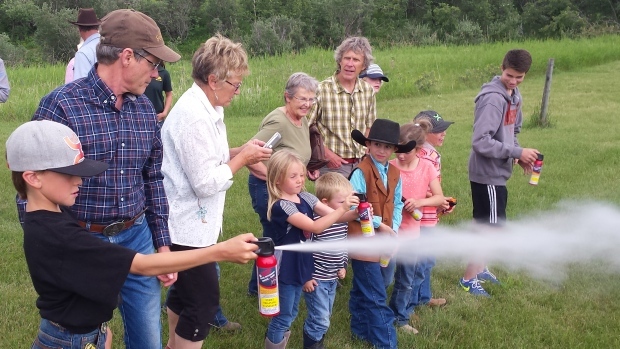 BAR U RANCH — One by one, residents and landowners in Alberta’s foothills grabbed a can of inert bear spray and practised spraying it at a wood cut-out of a bear about five metres away. The lesson was part of a bear safety workshop held for about 50 area residents on Friday. “It’s nice to come and get some instruction,” said Wendy Dunn, a Calgarian who lives with her husband, John, in the Porcupine Hills. 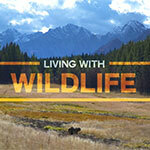 They’ve seen a lot of black bears and cougars, and their neighbours have seen grizzlies on their property. It’s a new reality in ranching country east of the Rockies in the past decade, leading to increasing conflicts between landowners and large carnivores in recent years. Click to view the full article on the Calgary Herald website. Farmers and ranchers in southern Alberta have been seeing more bears in recent years and a workshop has been designed to help them deal with the encounters. A key part of the workshop is learning how to use pepper spray effectively. Children as young as eight are included in the training. Alberta Parks spokesperson Jay Honeyman says they have run the workshop several times and it is paying off. Click to view the full article on the CBC News Calgary website. «Carrying Bear Spray is now fashionable!